Once you have gathered your materials for your sewing machine cover (part 1 in this series of posts) and taken all the relevant measurement for cutting your pattern pieces (part 2), you’ve made your way to the really fun and beautiful bit of the project: the embroidery. Though this pattern is given to work perfectly with the Embroidered & Quilted Sewing Machine Cover project, it can of course be used for any project or artwork that you may with to use the embroidery pattern with. 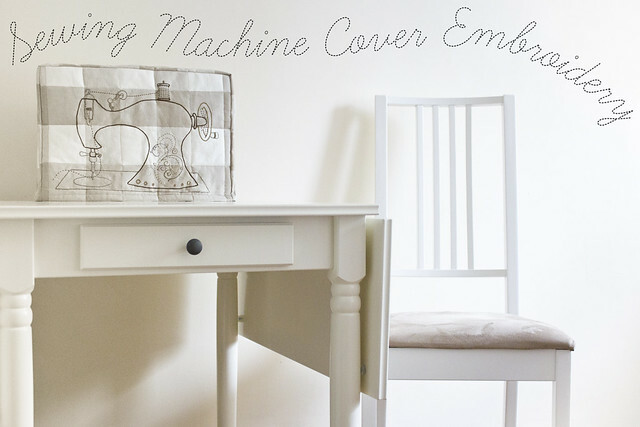 You can, of course, make your sewing machine cover with no embroider for a more minimalist look, but if you want to really make the project shine it is recommended that you at least give the embroidery a go: it is a complete beginner’s project and only three stitches (all described in the tutorial below) are used. The embroidery pattern consists only of simple lines. If you wanted a simpler pattern you could leave off the decorative swirls on the side of the machine, but again they are quite simple to stitch and worth the little bit of extra time to complete. After downloading the Free Sewing Machine Embroidery Pattern you will need to transfer it to your fabric. 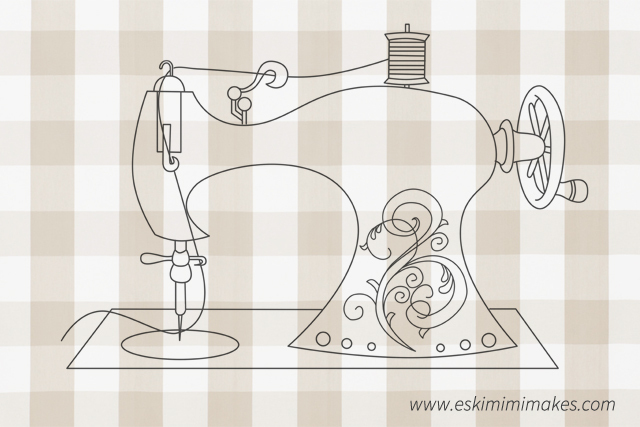 The PDF download is sized to be printed on an A3 sized sheet of paper, which should be about right for most sewing machines but can be re-sized as needed. If you do not have access to an A3 printer, many libraries and print shops will be able to print the design for you, or you can select to tile the printing on two smaller sheets of paper and join these together (consult your printer manual for instructions on how to do this). To transfer the design to your fabric it is suggested that you use dressmaker’s carbon paper which is wisely and inexpensively available. Give your fabric and iron to make sure it is crease-free and lay it right side up on a stable, hard surface. Place your carbon paper carbon-side down onto your fabric and your printed embroidery design with the print facing upwards on top of this. Once everything is centred, pin all three layers together. Using a smooth writing Biro pen, trace over all of the lines of the printed design, pressing down on the hard surface to make the marks distinct. Once you are sure that every line has been traced, un-pin your layers and admire your tracing skills ready to start stitching. Place your fabric in your embroidery hoop to keep the surface taught and begin stitching over the design that you have marked. As this was my first embroidery project and very much a beginner’s undertaking, I only used three simple stitches in completing the embroidery: running stitch, back stitch and stem stitch. Each of these are simple linear stitches and will give you lines of various weights and properties, all covered in the guide below. This is the simplest of all the stitches. It’s simple in-and-out motion is usually the first stitch used by children learning to sew, but there are a few pointers that will help make the stitches more beautiful. The stitch can be worked left to right or right to left – whichever feels more comfortable to work. After securing the thread at the back of the work with a simple knot the needle is brought up through the fabric and then back down in a series of stitches that follow the pattern line. To keep this stitch neat the stitches should be of equal length and at an equal distance – spacing should be reviewed for consistency. This stitch has the ‘lightest’ look of all the stitches given here due to the spaces in between the stitches giving the appearance of a dished lines, so use this for the lines of the design that you wish to appear least bold. 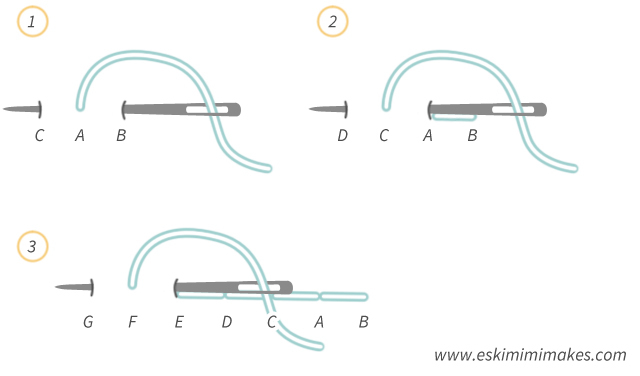 The ‘weight’ of the stitched line can be given a different appearance by lengthening or shortening both the length of the stitches and the space between them (refer to step three in the diagram above). A line of long stitches with short spaces in between them can give a heavier look then a line of very short stitches which are spaced further apart. Use this to give variety to your lines of running stitches. A suggestion of a change of speed or weight can be given by slowly adjusting stitch and space length along a line of stitches. A line of stitches where the stitches begin very long and then gradually get shorter until they appear only as pin pricks can give the impression of the line tapering off into nothing, or into the distance. This stitch provides a clean, solid line of exactly the same weight as the thread(s) you are working with. Unlike running stitch there are no spaces between the stitches so a well executed back stitch will give you a nice, clean, solid line. This stitch should be worked right to left for a right-handed person, or in the opposite direction for someone who is left-handed. Instructions are given here for a right-handed stitcher. Step 1: After securing the thread at the back of the fabric with a simple knot, bring the needle up through the fabric (A). Pass the needle back down through the fabric to the right of point A at the desired stitch length (B) and back up through the fabric (C) to the left of point A. Points B and C should be the same distance from point A for neat, even stitch length. Step 2: To make the next stitch, pass the needle back down through the fabric at the left point of your last completed stitch (point A). You should aim to pass the needle through exactly the same point where your needle first made a hole. 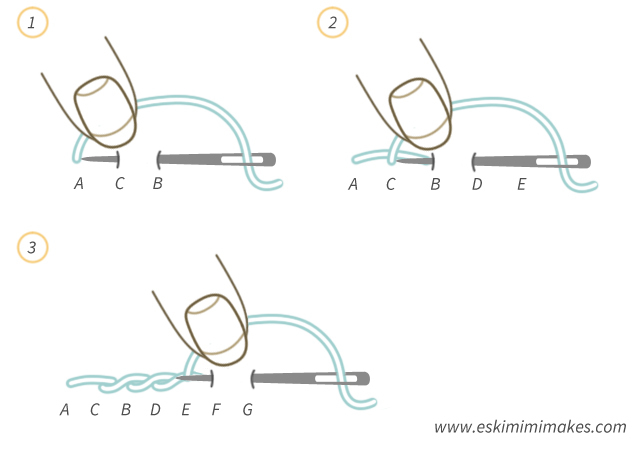 Bring your needle back up through the fabric to the left of where your thread emerges from the fabric, again maintaining an even stitch length (D). This stitch is very neat and easy to execute once the rhythm of the stitches is established. Remember to review stitch length for consistency and to stitch carefully along the lines to ensure a smooth finish. The weight of back-stitched lines can be altered by the number of strands of embroidery thread used. A single strand of embroidery thread can be used for very light lines and up to three for more substantial lines. The Sewing Machine design was stitched throughout using three strands of embroidery thread for a bold result. When working around tight curves a shorter stitch length is preferable so as to give a smooth contour to the lines rather than a staggered or jagged appearance, unless that is the look specifically desired. This stitch provides a weightier line of slightly overlapping, smooth stitches that appear like satin at a longer stitch length and as if to twist rope-like around each other when the stitches are kept very short. This is the boldest of the three stitches given here and should be used for the lines which are desired as most prominent. This stitch is similar to the reverse side of back-stitch and has a similar rhythm when being worked. There are several ways of working this stitch and the method given here helps to ensure that the stitches are neat and all worked around each other in the same direction. Step 1: After securing your thread at the back of the fabric with a simple knot, bring the needle up at (A). Pass the needle back down though the fabric at a point to the right (B) at desired stitch length. Bring the needle back up through the fabric half way between points A and B at point (C) whilst holding the thread above the stitching line with the non-dominant hand until the thread is completely drawn through. Step 2: Pass your needle down through the fabric (D) ensuring that the stitch length is kept consistent. Bring the needle back up at fabric at point B, through the same point in the fabric as the end of the previous stitch. Keep the thread held above the stitching line with the non-dominant hand until the thread is completely drawn through. The stitch length should be regularly reviewed to ensure neat and consistent work. By making sure that the needle passes through the fabric at the same point where the stitches meet will result in a smooth stitch line with no jagged edges. Shorter stitches have a shorter distance to travel around each other, so the result is a more twisted ‘rope’-like result with some texture. Longer stitches can result in a smooth line with a satin-like appearance. The sewing machine embroidery pattern can be stitched using any combination of the three stitches above, as well as any others you may enjoy working. The design can be stitched using only one of the stitches if so desired, but by varying the chosen stitch, colour and number of strands of embroidery thread used and variables such as stitch length the overall appearance of the design can be given subtle variation. Main outlines can be worked in bolder stitches whilst delicate design elements can be worked with a lighter touch. The key things to remember if this is a first embroidery project is to take your time and enjoy watching the work build. Experiment with stitching on a scrap piece of fabric to test variables and to see if you favour particular stitches. Once the embroidery is finished it will be used to complete the sewing machine cover in the next post, so stay tuned! I appreciate your tips. I am so clumsy with hand sewing. Even the simplest things take me a long time. While reading this tutorial, I am wondering how to adapt the design to work it on the machine with a darning foot (feed dogs down) for some ‘freestyle’ machine sewing.